The Rocky Mountain Bee Plant is a member of the Cleome Family. It grows to 4 feet in height and has green, leaflets which grow to 3 inches in length all along the stem. The plant typically grows along roadsides and in fields at elevations between 4500 - 7000 feet. The Rocky Mountain Bee Plant is a favorite of bees and hummingbirds. 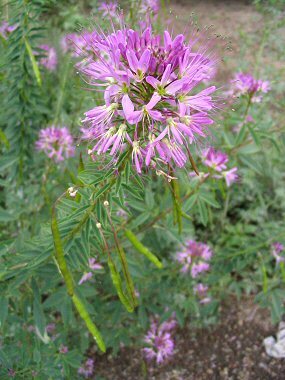 The Rocky Mountain Bee Plant typically blooms between June - September and produces pink to purple flowers which grow in an elongated cluster to 3 inches in length, followed by a thin green seed pod to 2.5 inches in length.